This Book of Meditations is a classic and is steeped in Carmelite spirituality. For every day it offers two meditations, arranged according to the liturgical season (1962 Missal), that enable the soul to enter the conscious presence of God and to reflect on the theme of the day. These are followed by a Colloquy that helps the person at prayer to start a friendly conversation with God where acts of praise and love, petition and thanksgiving are made, together with good resolutions for the future. Here we are at the very heart of prayer, which is a heart-to-heart encounter in faith with the living God. Divine Intimacy is the highest state attainable on earth. In this union of love, the soul produces acts of love which have an immense apostolic influence on a multitude of souls. This knowledge of the ways that lead to God, according to the teaching of the renowned Spanish mystics, is distilled into the pages of this book. 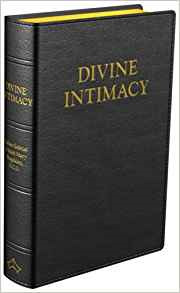 The original edition of Divine Intimacy was published in Italian under the title "Intimità Divina del P. Gabrielle di S. Maria Maddalena". This edition is the English translation by the Discalced Carmelite Nuns of Boston published under licence from Monastero S. Giuseppe Carmelitane Scalze, Roma, Italia. This edition has been re-typeset using the text of the 1964 edition originally published by Desclée Company.